Each release of IBM® z/OS® DFSMS builds upon the previous version to provide enhanced storage management, data access, device support, program management, and distributed data access for the z/OS platform in a system-managed storage environment. 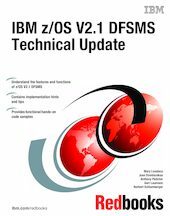 This IBM Redbooks® publication provides a summary of the functions and enhancements integrated into z/OS V2.1 DFSMS. It provides you with the information that you need to understand and evaluate the content of this DFSMS release, along with practical implementation hints and tips.